Archaeological finds more than 2,000 years old were found by Police in southern Italy who were searching for illegal weapons. The pieces are thought to have come from settlements and burial sites in central and southern Sicily, but some had signs of salt incrustation, suggesting they had been fished out of the sea. 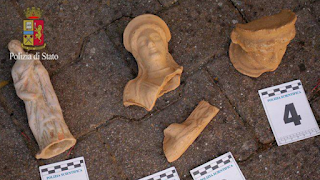 Officers were looking for arms and ammunition in a house near the Sicilian city of Enna when they found a stash of artefacts which date from between the 5th and 2nd Centuries BC[...] In total, 254 pieces were seized from the site, including dozens of vases, oil lamps and terracotta figures [...] stored in cardboard boxes and plastic crates, wrapped in newspaper. "It's likely that they were ready to be put on the black market," says Gabriele Presti, head of the investigation team. The homeowner - a man with a string of previous convictions - was arrested. The artefacts gave now been handed over to the cultural heritage authority in Enna. So collectors, do you know who is supplying the suppliers of your dealers? Do you know where that artefact has been? Do you want to know?